New Delhi: India and the US discussed maritime cooperation in the second round of the India-US Maritime Security Dialogue, the External Affairs Ministry said on Thursday. "During the Dialogue, the two sides exchanged views on maritime developments in the Asia-Pacific and Indian Ocean Region and considered steps to further strengthen bilateral maritime security cooperation," the ministry said in a statement. "They also reviewed the implementation of the decisions taken at the first Maritime Security Dialogue held in May 2016," it stated. The Dialogue was held on May 9-10 in Newport, Rhode Island, in the US. 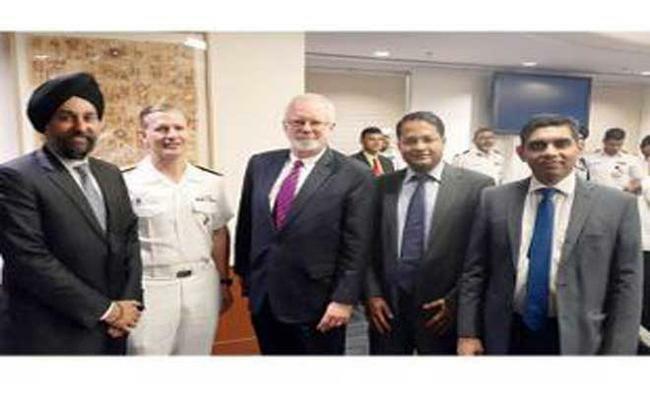 The Indian delegation was led jointly by Pankaj Sharma, Joint Secretary (Disarmament and International Security Affairs) and Munu Mahawar, Joint Secretary (Americas Division) in the Ministry of External Affairs, and Devika Raghuvanshi, Joint Secretary (Navy) in the Ministry of Defence. The US side was led by David Helvey, performing the duties of Assistant Secretary of Defence for Asian and Pacific Security Affairs, and Sean Stein, Acting Deputy Assistant Secretary of State for South and Central Asian Affairs. The next round of the Dialogue is scheduled be held in India, according to the statement.